Cheryl was awarded the Lon Hocker Trial Lawyer for showing noteworthy professional competence as a trial lawyer by the Missouri Bar Foundation in 1996. 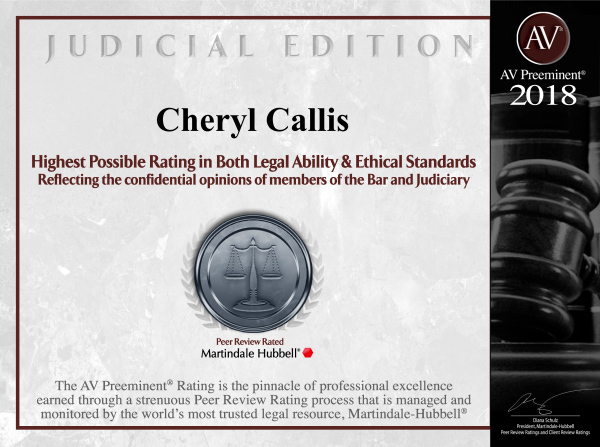 Missouri Lawyers Weekly also acknowledged Cheryl's professional achievements by selecting her as one of five "Up and Coming Lawyers" in Missouri in 2000, noting: "Callis is not only respected by jurors, but also by plaintiffs and defense attorneys for both her legal capabilities and civility." In more recent years Cheryl has been named as a "Super Lawyer" of Missouri, an honor only given to five percent of all lawyers statewide. Cheryl has tried close to 100 cases in Missouri and Illinois and has received many defense verdicts. These trials included automobile, premises liability, products liability, medical malpractice, trucking liability, breach of contract, real estate and employers' liability cases. Cheryl and her husband Charlie are the proud parents of Robbie (15) and Jessica (12).